Enjoy privacy within your screen room, or on your patio, porch, balcony, or wherever. Enjoy protected outdoor living to the full extent! And, for windows, the proper shade screen material can mean no need to "pull the blinds" during the day. When you want one-way-view privacy (where you can see out and outside viewers cannot see in), high density shade screening material (such as PolyCB2 MX-90) can often do the job. Privacy acquired from shade screen mesh (sun block screen) is dependent upon optic values that relate to differential lighting and distance. In the case of distance, when close to the screen you have the "keyhole" effect with the pores (open weave areas) of the screen being more predominate in your field of vision. When further away, the entire mass of the screen becomes more predominate and appears as a solid object. Differential lighting involves the reflectivity of the screen fibers or mesh strands. During the daytime, with "outside" being brighter than "inside", the high reflection from the screen is more predominate to the outside viewer than is the dull areas represented by the pores. Conversely, for the inside viewer (when looking out during the day) the light coming through the pores is the more predominate. The "outside" then becomes highly visible. This is where the term, "daytime privacy" comes from. Nighttime privacy can sometimes be acquired by installing a light in a position that it shines away from the screen and has a reflector on the light source that absolutely shields the screen from any of the light's direct beams. High reflectivity comes from precisely extruded stands that make up the weave. These strands must be designed and coated to increase reflection. 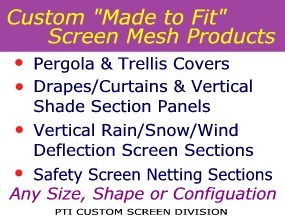 The weave of the mesh must then be regulated to create small pores accurately proportional to the extruded strands. This exacting process (which includes regulating pore size) creates a clear and undistorted outward view while still maintaining the needed surface of reflection.